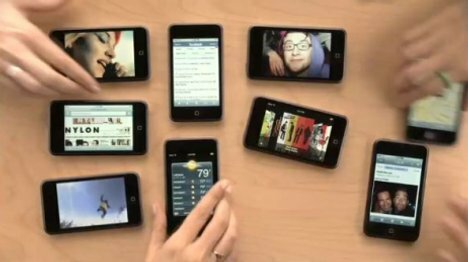 Apple is promoting the iPod Touch with a new TV ad, “Grid”, featuring the song “What I’m Looking For” by Brendan Benson. Fingers are used to navigate the iPod – on the screen, beginning with the music selection menu, choosing the Brendan Benson album, Alternative to Love. We’re given access to international weather, showing that the temperature in Portland is 46 degrees compared to 79 degrees in Honolulu. “Grid” was developed at TBWA\Media Arts Lab by chief creative officer Lee Clow, executive creative directors Duncan Milner and Eric Grunbaum, creative director Scott Trattner, copywriter Go Sohara, art director Jamin Duncan and Demian Oliviera, agency producers Maresa Wickham and Erica Bice. Filming was directed by Mark Coppos and Virginia Lee via Green Dot Films, with director of photography Robert Doumitt. Editors were Glenn Martin and Jared Coller at Nomad Editing Company. Post production was done at Company 3 by Brian Robinson and Stefan Sonnenfeld, and at Mork & Lys by Kevin Shapiro and Brandon Sanders.